Sure, you need them to power up your devices, but wouldn’t it be nice if cords could just be banished from view? These 3 solutions prove that where there's a wire, there's a way. After you’ve spent years getting your living spaces in line, it can be almost maddening to walk into a room that has everything in its place only to have your eyes linger on unsightly wires that run rampant from your electrical devices. While you may think that there’s no cure for this tangly trouble, don’t be discouraged. Instead, try one of these three inexpensive DIY projects to disguise those cords hanging from your TV, computer, lamps, and more—you’ll preserve your sanity and your cash. Mounting the TV is popular among homeowners in quest of a clean-lined living space. But along with the sophistication of a sleek, lofty screen comes an array of dangling cords that can make your viewing area look more dorm room than curated creation. To conceal a smattering of wires, try this makeshift mantel that tucks stray cords beneath an inexpensive molding. 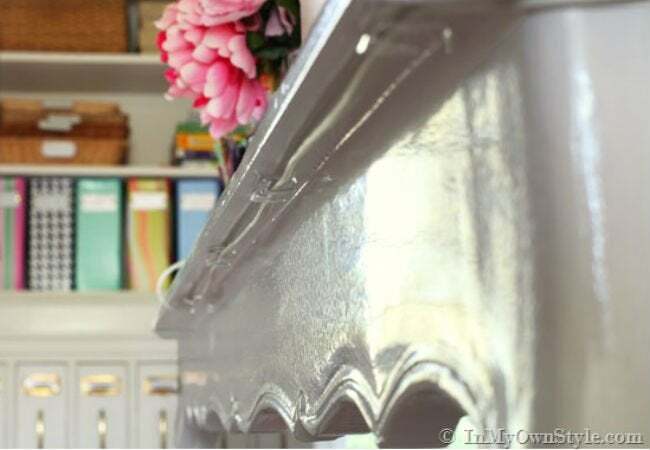 Start by choosing a style of crown molding shelf that best matches your room’s aesthetic. 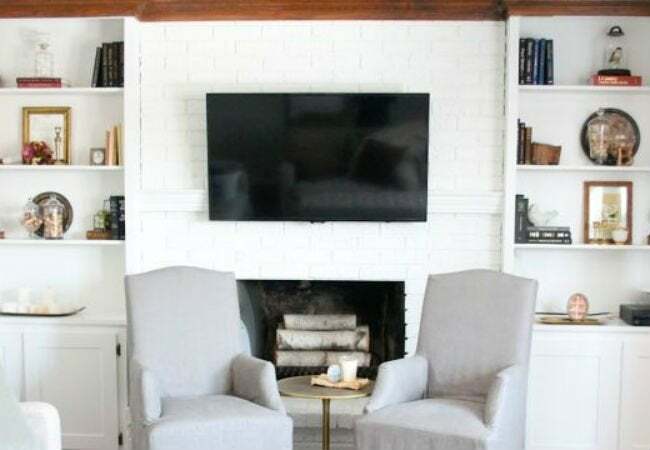 Julie Blanner, the brains behind this brilliant fix, chose a traditional white version to complement her classic living room. Next, measure and mark the shelf on both ends, and cut it down to the exact size you need. Feed the cords through one side of the molding—Julie drilled a hole in her built-ins to further camouflage the unpleasant necessities—and then attach the shelf with glue. Voilà! Movie night just got so much better. If a jumble of computer cords is cramping your desk style, try this solution from Organizing Made Fun that will stealthily stash away wires while keeping them accessible. First, cut a piece of pegboard to size, about 1/4 inch smaller on all sides than the space beneath the desk so you’ll be easily able to pull back the board to reach the cords. Next, give the pegboard a few coats of spray paint, or leave it blank—whatever best matches your decor. Use cable ties threaded through the pegboard holes to attach a power strip to the back of the board so that the outlets face the wall, then secure the board in place using light clips and Velcro. This combination of fasteners will ensure that your designated disguiser won’t tip forward yet will still be easy to remove whenever you need to unplug. Now you see them, now you don’t! That’s how we feel about this clever trick from Diane of In My Own Style, which discreetly hides wires in the nooks and crannies of furniture. First, gather a wire basket, a power strip, an extension cord, cup hooks, and clear cord organizing clips. Cut one of the corner pieces off the basket using a wire cutter, and then use cable ties to secure the extension cord to the basket. Next, screw in cup hooks to attach the basket upside down to the bottom of your desk so that the extension cord remains easily accessible. Using the clear cord organizing clips, run cords and wires up the legs and along the underside of your tabletop until you reach the power strip. Thread the cords through the hole in the basket, and plug ’em in for a seemingly wireless experience.